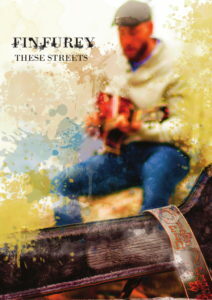 When we first spoke to Fin Furey last month he told us of his storied musical upbringing, having been exposed to the life of recording and performing from an early age through travelling the world with his decorated clan – “from buskers to my father Finbar”. It was a nurturing period which has set Fin in good stead for his own excursions. And not just in the creative sense, as the singer-songwriter has since set about launching a solo career of his own in his now home of Toronto. He settled in the world’s foremost melting pot after initially moving to Canada with his girlfriend Jess in 2015, with whom he lived and travelled with in a rented van for “7 or 8 weeks” before settling in the city. The move came after he had initially planned to relocate to London with “the makings of a band”, only to then meet Jess, which led to the decision that her homeland was the right port of call instead. The move has coincided with the Dubliner now recording and releasing material under his own name, and he credits the support network around him for their backing throughout the process. Those late-night writing sessions are reflective in Fin’s work, where lyrics are pivotal when constructing songs. He’s explained previously that he has taken inspiration from the music ingrained in his heritage, but has implemented it into his own work rather than mirror the sound entirely, with storytelling being one of the key foundations of the traditional music that he infuses his blues-influenced sounds. All of this is prevalent on These Streets, his debut EP that features four tracks laden with narrative, history and personal experiences. The record is an expression of self that can almost be broken up into two parts, with the first two songs focusing on the broader aspect of Irish history that Fin holds close to heart, with the latter pair being more personal and pertaining to his own lived experience. The title track is in essence about the 1916 Rising and aims to tell the story from both perspectives from an objective standpoint – as challenging as that may be - and was written by Fin whilst he felt homesick during the time of the century anniversary of the rebellion. His traditional music icon father Finbar telling him “if you’ve no past you’ve no future” inspired Fin in the writing process on such themes, and he even provides instrumentation on ‘Old Crumlin Road’. There’s an underlying theme of duality that permeates throughout the EP. Even when moving off the topic of Irish history and into that of intimacy in the song ‘Love Fever Blues’, Fin approaches the subject from both sides, the good and the bad. These Streets finishes with the song ‘Corners & Coins’, and was inspired by a friend of Fin’s, and the trials and tribulations he was experiencing through his own choices and want to be loved. ‘Corners & Coins’ also has an accompanying music video, which dropped in September, and through a serendipitous turn of events was directed by acclaimed Irish actor Robert Sheeran. With the EP on the horizon, Fin was already considering would-be music videos, and in the midst of picking Sheehan’s brains about the shooting and editing processes they entail, the star of Misfits and Love/Hate offered to provide first-hand assistance himself. The video is shot in a live setting in a small bar in Toronto called B-Side Lounge, and opened doors for Furey to work with a new set of innovative minds that kept his own creative juices as a result, an experience that has aided him for subsequent live performances. Fin Furey’s Canadian excursion started with a rented van, and he rather fittingly intends to bring it full circle upon his (temporary) return to Ireland by “doing up a van” and touring his EP. Booking dates are yet to be fully ironed out, but shows across July and August in both Ireland and the UK are in the pipeline, and by Fin’s own admission he can’t wait. These Streets is out now.